Personally...I consider myself old school. Back in the day it was one of hundreds of nicknames my friend gave me and it was stenciled onto my bright red Ibanez Super Strat. Of course, at the time I was 19 and anything but old school. I was too young and dumb to even know what old school was. Today we're looking at an old school death metal band, but we're not talking about early to mid 90's death metal, but even older than that. The type of music contained herein was forged in hell before Chuck Schuldiner of Death ever released a note. This goes back to when death metal became something more than thrash metal, but before the formula was created. There's a studio in Tampa, FL called Morrisound Recording Studio where the method of recording death metal was created. It was the first time that blast beats could be heard properly, at least so said Deicide in their documentary. But this was not the beginning of the genre. There was a time when extreme metal didn't exist and it started clawing its way out of Black Sabbath and Judas Priest...and then out of Motorhead and Metallica. With that frame of reference I give you Diavolos. This album sounds like it was recorded in the same place that Black Sabbath unearthed their seminal debut album, but in half the time of that landmark record. Original death metal pioneers like Master, Possessed, et al didn't sound polished and finished, but they had a terrifying feel about them. But they were far scarier. 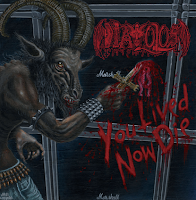 Diavolos is true horrorshow music. Writing songs about the devil, death, and more. This is the kind of music that would have terrified out politicians in the 80's. In death metal terms, the songs are slow and deliberate, but containing feeling and power. Diavolos has the ability to write songs based on feel alone. They chose to color outside of the death metal lines, as their forebears did some 30 years ago. Shifts, changes, and dynamic playing make this album a ride. Metallica was one of the first bands to include mellow interludes, but they largely only have two sounds, dirty and clean. Diavolos has clean, somewhat dirty, dirty, very dirty, and Satan's waiting room. Their ability to write songs follows a very similar pattern. Consider their debut, You Lived, Now Die, not as a non-fiction historical book, but as historical fiction. 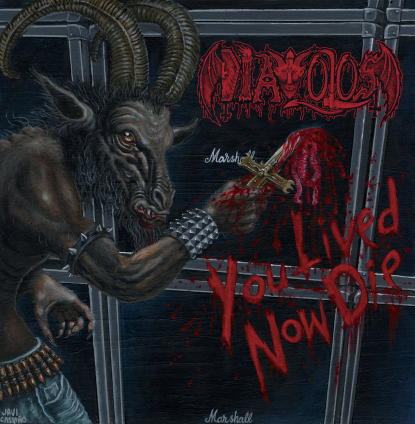 There was a time before blast beats and full on cookie monster and Diavolos can show it to you.